Howdy Ags! Welcome to the Write Right podcast. 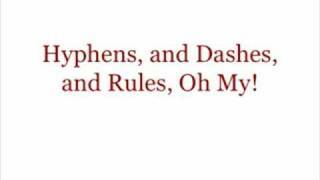 Today we are going to talk briefly about how to use hyphens and dashes. The two can be confusing, so we are going to learn the difference between them and when to use them in a sentence. When you break it down, the difference is simple. Hyphens are used to punctuate in between individual words, while dashes are used to punctuate whole sentences. Let’s look at each of these concepts in further detail. However, it is important to note that hyphens are only used when the modifiers come before the noun. We would use a hyphen if we were to say that Picasso is a “well-known artist,” but we would not use a hyphen if we were to say he is an artist who is well known. Also, do not use a hyphen after words that end in “ly” or when one of the modifying words is the word very. Now, on to dashes. For our purposes today, we will discuss two types of dashes: the en dash and the em dash. These dashes are distinguished in the text by their length. The en dash has a very specific use. It is used with numerical ranges such as years, months, and times. Additionally, you find them when you talk about a connection such as a “father-daughter relationship” or last week’s football score that was 21-31. Both the “en dash” and the “em dash” can be inserted into a text using the “insert symbol” feature in Microsoft Word. The “em dash” can also be created using two hyphens in a row. Well, that’s all the grammar we have time for today. Thank you for listening in to the Write Right podcast. Hopefully now you’ll be able to properly hyphenate your modifiers and add a dash or two to your writing for a little spice. Be sure to check out our other podcasts on more tricky grammar subjects.